Ryerson students and faculty gathered Wednesday to honour the victims of the Pittsburgh synagogue massacre and denounce anti-Semitism. Candles were lit as the names of the 11 victims from last Saturday’s shooting were read aloud during the ceremony, which was held in the Sears Atrium. 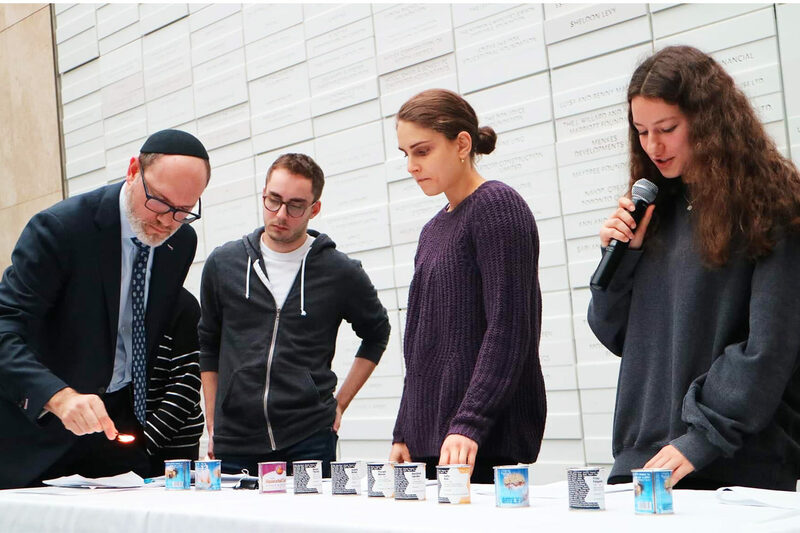 The event was organized by Ryerson’s office of equity and Hillel Ryerson, a Jewish student group on campus. Shira Gellman, one of the organizers, said she was inspired by the vigil that occurred in 2017 after the mosque shooting in Quebec. “The community came together at that time in a similar way which brought me a lot of hope in a time of great sadness,” she said. Members of different faiths were in attendance, including some Christians and Muslims. “To see all those people come and show their support, it makes me feel hopeful,” Gellman said. Following a moment of silence at the beginning of the ceremony, students from Hillel Ryerson paid their respects to the 11 people who were shot dead while attending prayer services at a synagogue in Pittsburgh last Saturday. The shooting is believed to be the deadliest attack in history on Jews in the United States. Students from Hillel read out descriptions of each of the victims’ personalities, as described by family in media reports, before lighting candles in their memory. Second-year Ryerson student and Hillel member Benjamin Brenman lit one of the candles. “It’s very important because of how deeply it affects me,” he said. Brenman is Jewish and said no one practising his faith, or any faith, should fear expressing their beliefs. Rabbi Aaron Greenberg, the Canadian director of the Orthodox Union, said prayers during the ceremony. He said it was the third memorial service he had attended on a university campus in two days. Greenberg has a connection to one of the shooting victims. He met Joyce Feinberg, who was 75 years old when she was killed Saturday, on a number of occasions when she lived in Toronto. He remains in touch with some of her family and friends. Feinberg was a very kind woman, Greenberg said. She was described by family and friends as a caring, compassionate woman who was dedicated to her faith, he added. Greenberg will be seeing a very close family friend of Feinberg’s in the coming days, he said. “I will be telling him that at a moment’s notice, over a hundred people in the middle of a work day, a school day, came out to pay tribute to his sister in addition to the other 10 victims, trying to provide him and his family with a little bit of comfort,” he said. Throughout the event, speakers also condemned anti-Semitism and religious discrimination. “Anti-Semitism has been called the world’s oldest hate,” said Myer Siemiatycki, a Ryerson politics professor who helped to organize the event. In a “grim overlay of chronology,” he said, Thursday marked the beginning of Holocaust education week in Toronto. Siemiatycki said while the Jewish population has been discriminated against for centuries, people must continue working to bring communities together and combat discrimination of all kinds. This can be done by learning from the past and working with each other through events like Wednesday’s ceremony, he said.